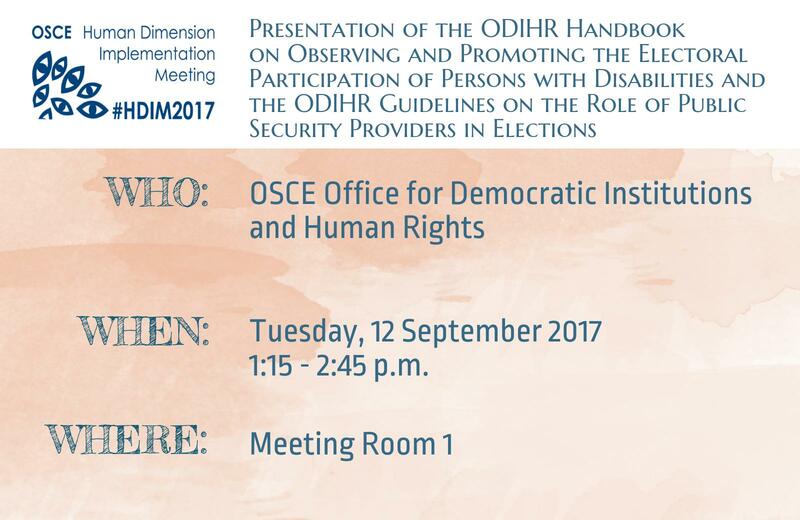 Europe’s largest annual human rights conference, organized by the OSCE Office for Democratic Institutions and Human Rights (ODIHR), is taking place in Warsaw, Poland, from 11 September to 22 September 2017. The simultaneous interpretation of debates serves to facilitate communication and does not constitute an authentic record of proceedings. The OSCE and the interpreters decline any responsibility for any errors or omissions that may occur in the interpretation, and for any damages that might arise from the use of the interpretation. I pledge to ensure that the simultaneous interpretation of debates accessible on this website will not be used in any manner by me, or any other person or entity, for any commercial gain purposes. Opening Plenary Session of the 2017 Human Dimension Implementation Meeting, 11 September 2017, Warsaw. Left to right: Polish Foreign Minister Witold Waszczykowski, ODIHR Director Ingibjörg Sólrún Gísladóttir, Austrian Deputy Foreign Minister Michael Linhart and OSCE Secretary General Thomas Greminger during the Opening Plenary Session of the 2017 Human Dimension Implementation Meeting, 11 September 2017, Warsaw. Ingibjörg Sólrún Gísladóttir, Director of the OSCE Office for Democratic Institutions and Human Rights (ODIHR) addresses participants in the Opening Plenary Session of the 2017 Human Dimension Implementation Meeting, as Polish Foreign Minister Witold Waszczykowski (left) and Austrian Deputy Foreign Minister Michael Linhart (right) listen, 11 September 2017, Warsaw. Austrian Deputy Foreign Minister Michael Linhart, representative of the OSCE's Austrian Chairmanship, addressing participants in the Opening Plenary Session of the 2017 Human Dimension Implementation Meeting, 11 September 2017, Warsaw. Polish Foreign Minister Witold Waszczykowski speaking during the Opening Plenary Session of the 2017 Human Dimension Implementation Meeting, 11 September 2017, Warsaw. OSCE Secretary General Thomas Greminger delivers his remarks during the Opening Plenary Session of the 2017 Human Dimension Implementation Meeting, 11 September 2017, Warsaw. Lamberto Zannier, the OSCE High Commissioner on National Minorities, delivers a speech during the Opening Plenary Session of the 2017 Human Dimension Implementation Meeting, 11 September 2017, Warsaw. Harlem Désir, the OSCE Representative on Freedom of the Media, speaks during the Opening Plenary Session of the 2017 Human Dimension Implementation Meeting in Warsaw, 11 September 2017. Marietta Tidei, Vice-President of the OSCE Parliamentary Assembly, speaking during the Opening Plenary Session of the 2017 Human Dimension Implementation Meeting in Warsaw, 11 September 2017. Ingibjörg Sólrún Gísladóttir, Director of the OSCE Office for Democratic Institutions and Human Rights, opens the 2017 Human Dimension Implementation Meeting in Warsaw, 11 September 2017. The Opening Plenary Session of the 2017 Human Dimension Implementation Meeting, 11 September 2017, Warsaw. Claudia Luciani, Director of Democratic Governance at the Council of Europe's Directorate General of Democracy and Jonathan Cohen, Executive Director of Conciliation Resources, discuss key issues that threaten the human dimension in the OSCE region and how the organisation should respond during a high-level panel moderated by journalist Annabelle Chapman. The panel was part of the Opening Plenary Session of the OSCE Human Dimension Implementation Meeting in Warsaw on 11 September 2017. More than 500 delegates of OSCE participating States have registered to participate in the 2017 Human Dimension Implementation Meeting. 11 September 2017, Warsaw. Representatives of OSCE participating States at the Opening Plenary Session of the 2017 Human Dimension Implementation Meeting, 11 September 2017, Warsaw. A seat for civil society speakers in the plenary hall of the 2017 OSCE Human Dimension Implementation Meeting, Warsaw, 22 September 2017. Participants in the 2017 Human Dimension Implementation Meeting in Warsaw, 11 September 2017. 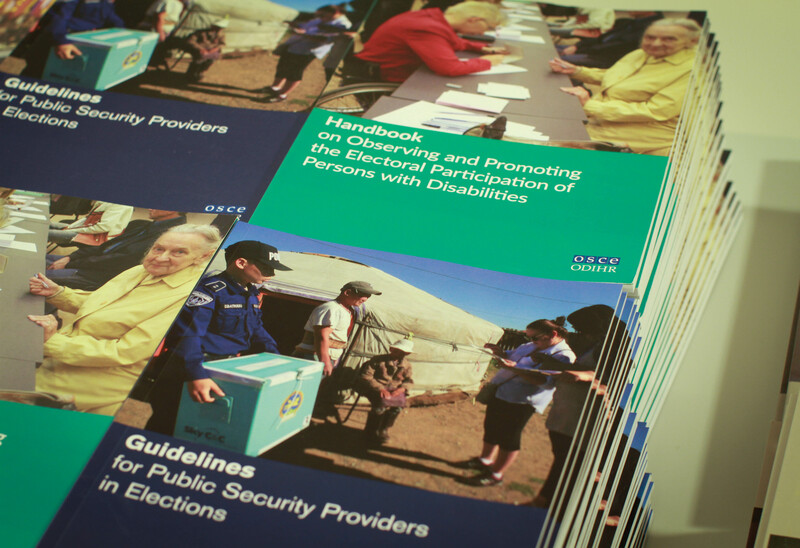 Two new publications, the Handbook on Observing and Promoting the Electoral Participation of Persons with Disabilities and the Guidelines for Public Security Providers in Elections, were launched by ODIHR at an event held in Warsaw on 12 September 2017 on the margins of the annual OSCE Human Dimension Implementation Meeting. 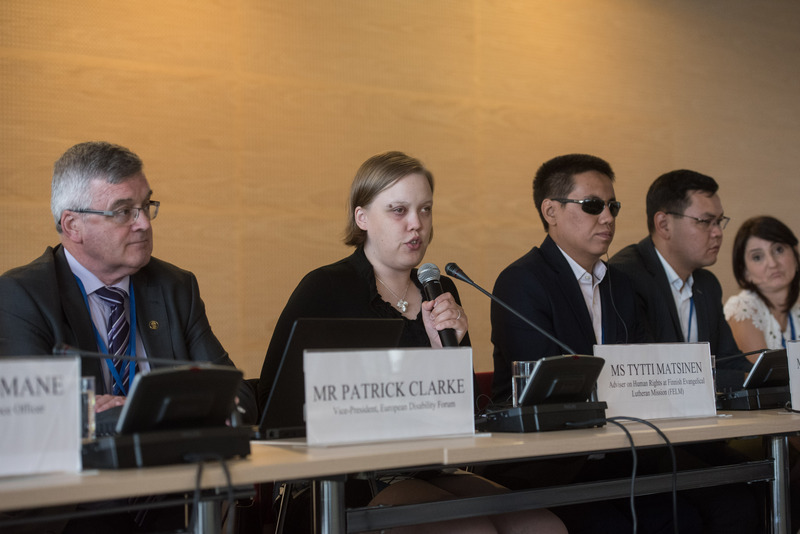 Tytti Matsinen, Adviser on Human Rights at the Finnish Evangelical Lutheran Mission, speaking at an event for the release of an ODIHR booklet to address the under-representation of persons with disabilities in political and public life. The event was held in Warsaw on 13 September 2017 on the margins of the annual OSCE Human Dimension Implementation Meeting. Dirck Ackermann from the German Armed Forces' Office of the Protestant Chaplaincy makes a presentation during a side event on freedom of religion or belief in the armed forces co-organized by the OSCE Office for Democratic Institutions and Human Rights (ODIHR) and the European Organisation of Military Associations (EUROMIL) on 14 September 2017, during the OSCE Human Dimension Implementation Meeting in Warsaw. Karoline Fernández de la Hoz Zeitler, Director of the Spanish Centre for Racism and Xenophobia (OBERAXE) at the Ministry of Employment and Social Security, speaking during an ODIHR event on countering hate crime held in Warsaw on 15 September 2017, during the annual OSCE Human Dimension Implementation Meeting. 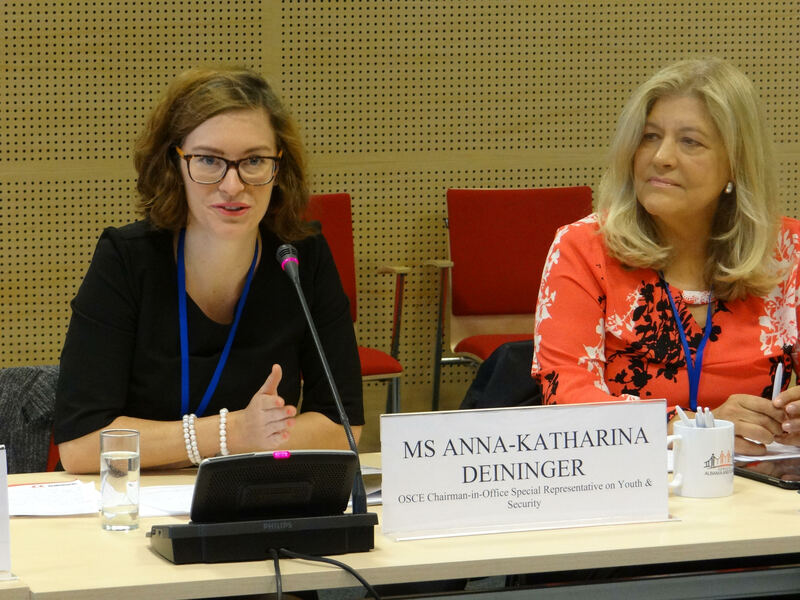 Anna-Katharina Deininger, the Special Representative on Youth and Security of the Austrian OSCE Charimanship, speaking during an event on youth engagement held on the margins of the OSCE Human Dimension Implementation Meeting, 18 September 2017, Warsaw. 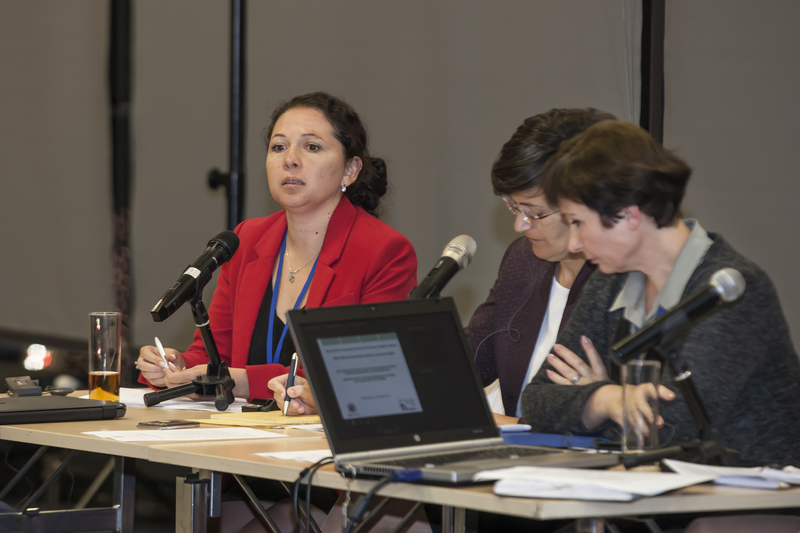 Taina Bien-Aimé, Executive Director of the Coalition Against Trafficking in Women (CATW), speaking about the role of civil society in countering human trafficking during an event organized in co-operation with the OSCE Office for Democratic Institutions and Human Rights (ODIHR) on the margins of the annual OSCE Human Dimension Implementation Meeting in Warsaw, 18 September 2017. Civil society representatives from Roma and Sinti communities during a training event on participation and advocacy organized by the OSCE Office for Democratic Institutions and Human Rights (ODIHR) on the margins of the annual OSCE Human Dimension Implementation Meeting in Warsaw, 17 September 2017. Zola Kondur, Vice-president of the Roma Women Fund "Chiricli" and Deputy Chair of an inter-ministerial working group on the protection and integration of Roma into Ukrainian society, speaking at an ODIHR-organized event on Roma security issues in Ukraine. 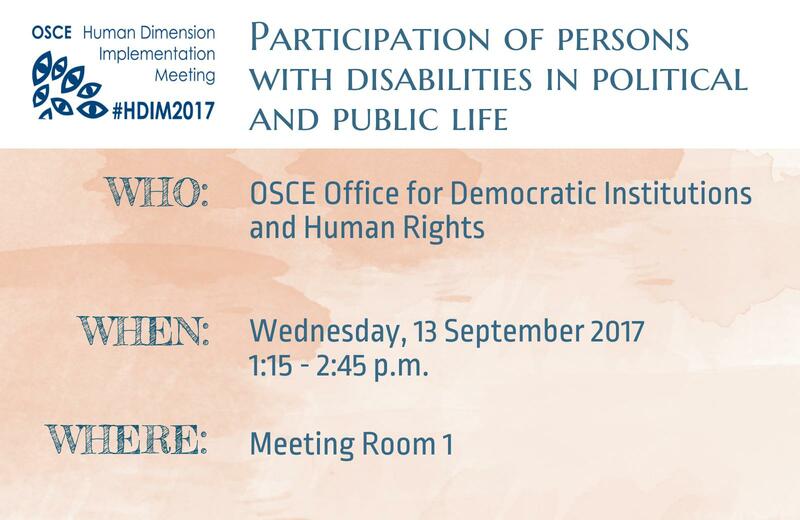 The event was held in Warsaw on 18 September 2017, during the annual OSCE Human Dimension Implementation Meeting. 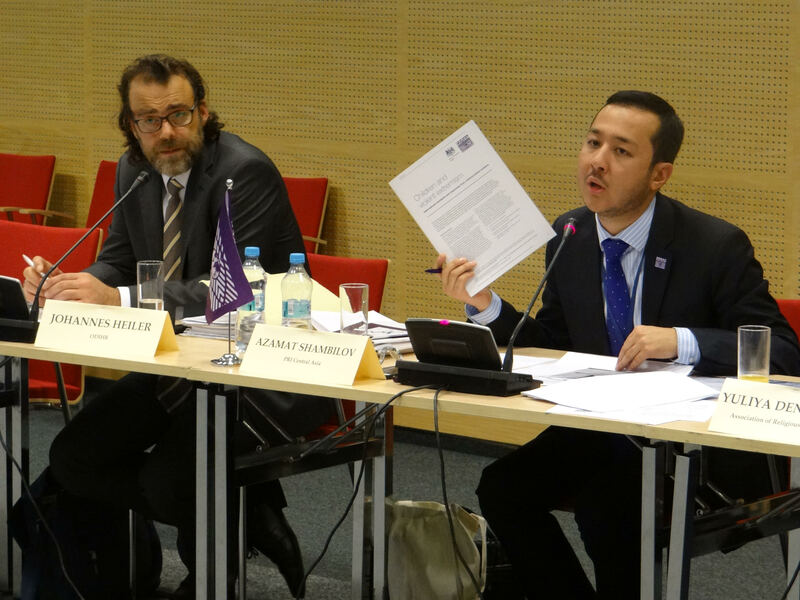 Azamat Shambilov, Regional Director of Penal Reform International in Central Asia, addresses participants in an OSCE/ODIHR-supported event on protecting human rights in prisons while countering violent extremism and radicalization leading to terrorism (VERLT), as Johannes Heiler, ODIHR Adviser on Anti-Terrorism Issues, listens. 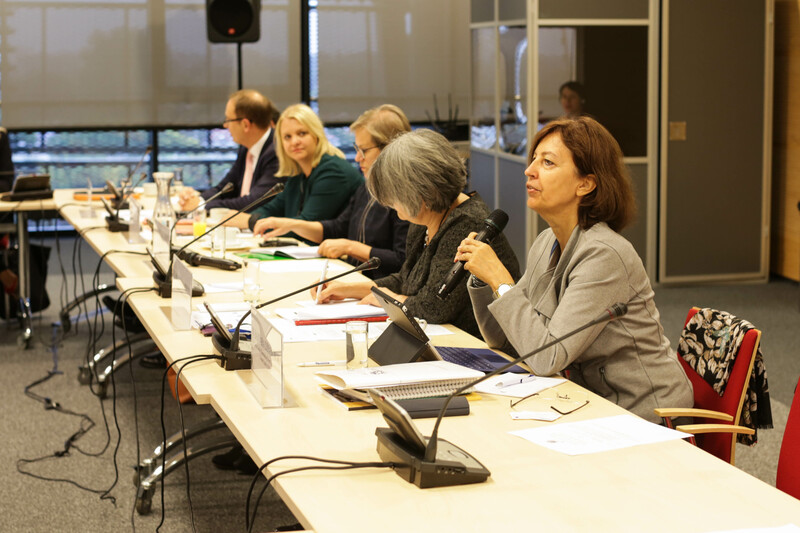 The event was held in Warsaw on 18 September 2017 during the annual OSCE Human Dimension Implementation Meeting. Ambassador Christian Strohal, Special Representative for the OSCE's Austrian Chairmanship, delivering a speech at the closing plenary session of the 2017 OSCE Human Dimension Implementation Meeting, Warsaw, 22 September 2017. Participants in the closing plenary session of the 2017 OSCE Human Dimension Implementation Meeting watching to a video address by Lyudmila Alekseeva, Chairperson of the Moscow Helsinki Group, Warsaw, 22 September 2017. Click the image below to access the high resolution version of the visual. The important role of civil society in promoting the implementation of human dimension commitments has been regularly highlighted by all participating States in OSCE consensus decisions. All participating States have also committed to invite and encourage the participation of civil society organizations with relevant experience in human dimension meetings. Click on the picture to learn more! 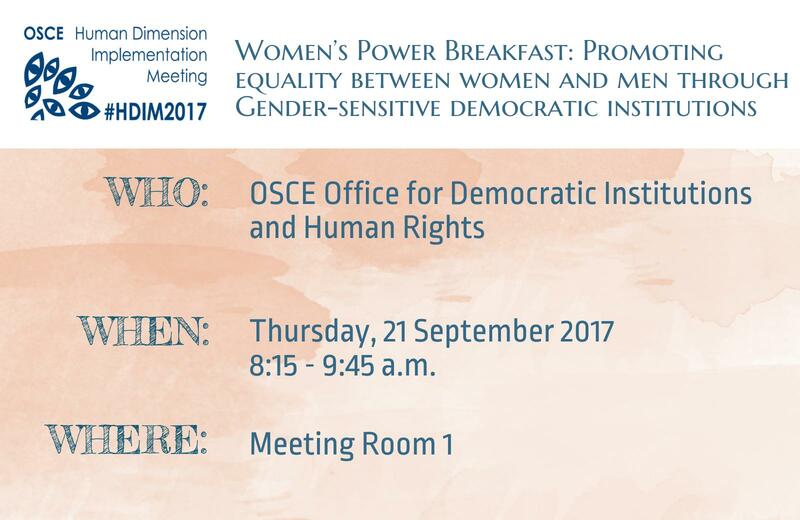 The OSCE Office for Democratic Institutions and Human Rights (ODIHR) held its annual Women’s Power Breakfast in Warsaw on 21 September 2017, focusing on how to promote and advance women’s political participation and gender equality through the work of democratic institutions. The event was organized on the margins of the OSCE Human Dimension Implementation Meeting. 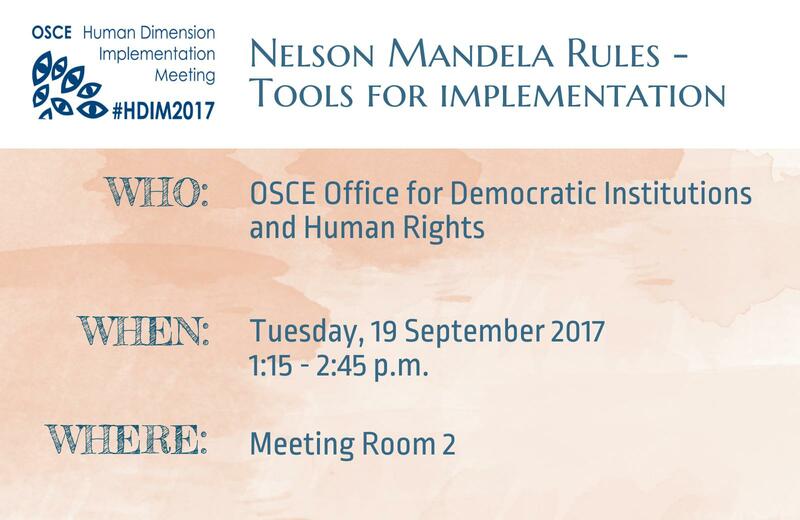 The OSCE Office for Democratic Institutions and Human Rights (ODIHR) and Penal Reform International (PRI) presented a draft preview of their upcoming guidance document on revised international standards for the treatment of prisoners, known as the “Nelson Mandela Rules”, at an event in Warsaw on 19 September 2017. The event took place on the margins of the annual OSCE Human Dimension Implementation Meeting. 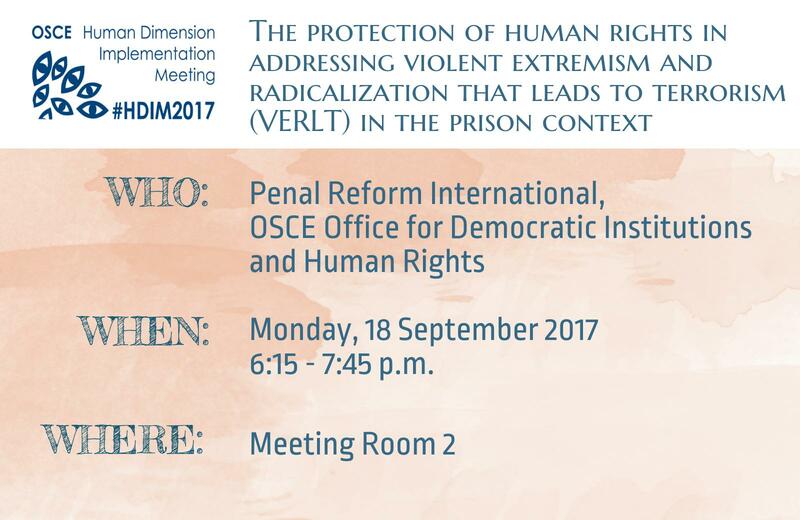 Protecting human rights while countering violent extremism and radicalization leading to terrorism (VERLT) in the prison context was the subject of a side event organized by the OSCE Office for Democratic Institutions and Human Rights (ODIHR) and Penal Reform International (PRI) in Warsaw on 18 September 2017, during the annual OSCE Human Dimension Implementation Meeting. 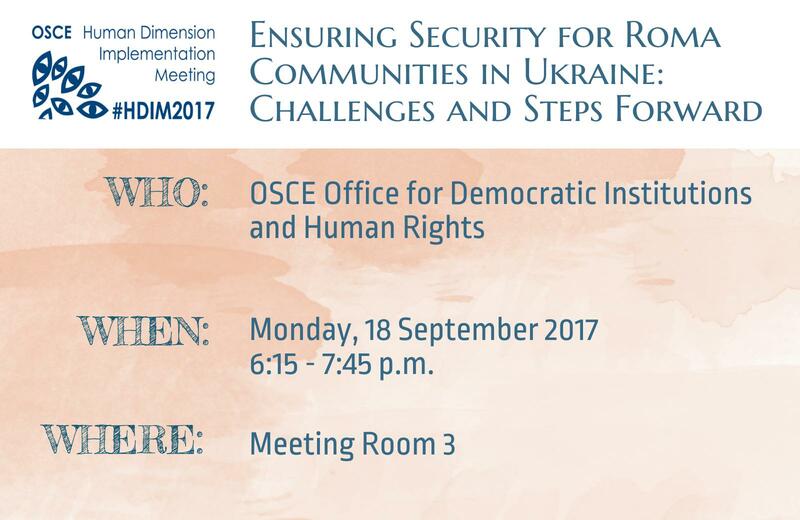 Ensuring security for the Roma community in Ukraine was the focus of discussions at a side event organized by the OSCE Office for Democratic Institutions and Human Rights (ODIHR) on 18 September 2017, during the annual Human Dimension Implementation Meeting in Warsaw. 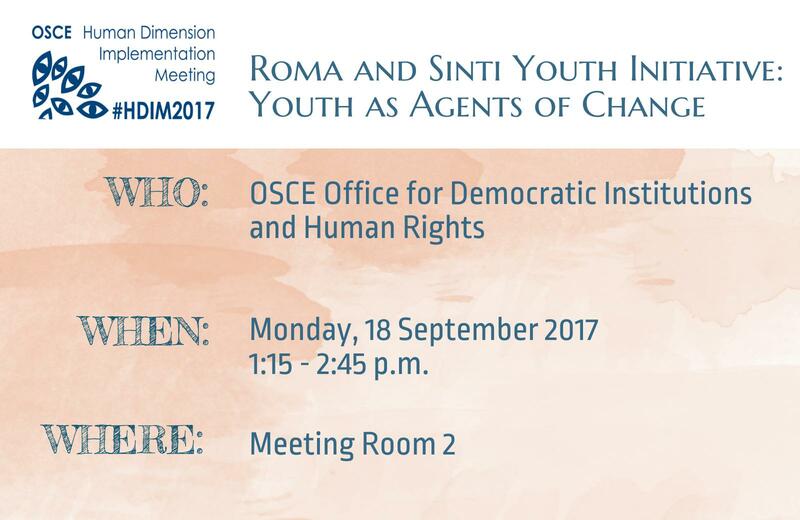 Experiences and good practices in supporting the participation of Roma and Sinti youth in the OSCE region were the main topic of a side event organized by the OSCE Office for Democratic Institutions and Human Rights (ODIHR) on 18 September 2017, during the annual Human Dimension Implementation Meeting in Warsaw. 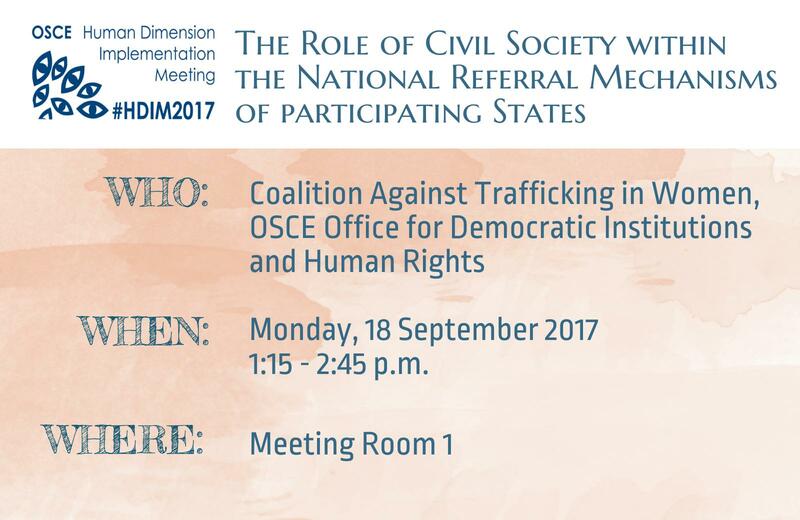 The important role of civil society in countering human trafficking in the OSCE area was highlighted at an event co-organized by the OSCE Office for Democratic Institutions and Human Rights (ODIHR) and the Coalition Against Trafficking in Women (CATW) in Warsaw on 18 September 2017. The event took place during the annual OSCE Human Dimension Implementation Meeting. 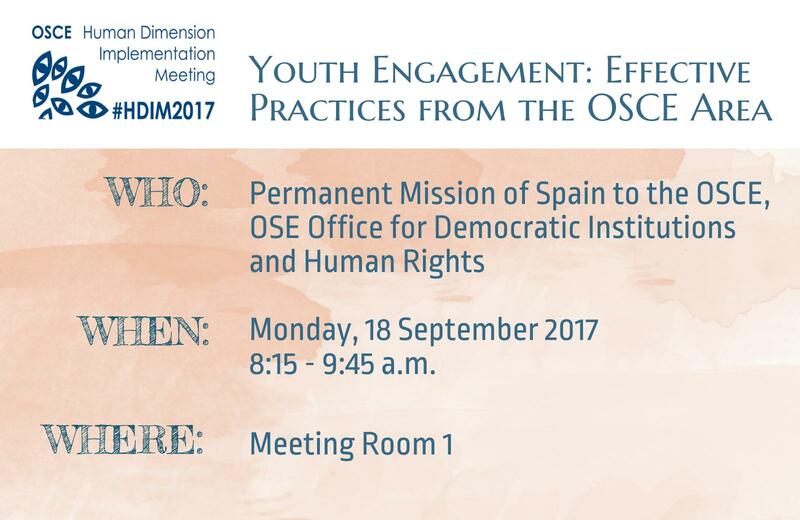 Exploring obstacles young people face in engaging with democratic institutions and sharing examples of effective practice to support youth political participation were the focus of a side event held on the margins of the OSCE Human Dimension Implementation Meeting (HDIM) in Warsaw on 18 September 2017. 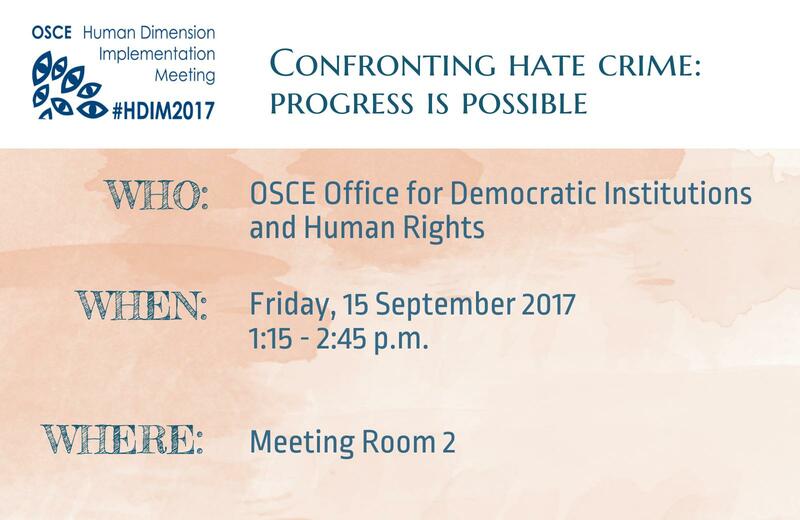 Using data to identify gaps and challenges in addressing hate crimes and adopting a comprehensive approach to countering these crimes were at the centre of discussions at an event organized by ODIHR on 15 September 2017, during the annual Human Dimension Implementation Meeting (HDIM) in Warsaw. 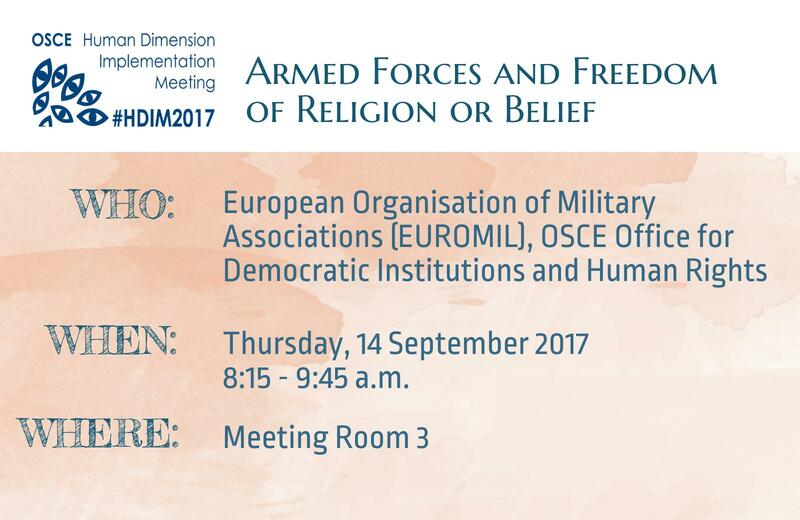 Sharing experiences from the OSCE region on the best ways to accommodate the religious and spiritual practices and needs of armed forces’ personnel was the aim of an event co-organized by the OSCE Office for Democratic Institutions and Human Rights (ODIHR) and the European Organisation of Military Associations (EUROMIL) on 14 September 2017, during the OSCE Human Dimension Implementation Meeting in Warsaw. Examples of positive practices to promote more inclusive parliaments, political parties and democratic institutions were the focus of an event for the release of a booklet produced by the OSCE Office for Democratic Institutions and Human Rights (ODIHR) to address the under-representation of persons with disabilities in political and public life on 13 September in Warsaw.